Sally Thomson: Hello. I am Sally Thomson. I am an Arts Development Officer for Aberdeenshire Council, and I am also the Arts Co-ordinator for Aberdeen Children’s Hospital. Tonight I am going to talk about my role as the Arts Co-ordinator for the Children’s Hospital, but both posts involve me in working in the public sphere. The Arts Project in Aberdeen Children’s Hospital has had two distinct phases. The first phase was definitely an architectural collaboration between artists and architects and this is one of the resulting pieces. This is The Ontological Garden, by Dalziel + Scullion. Though I was not involved in the first phase, the Hospital Managers had a vision of a building which all would appreciate as well-designed, and be perceived as a cherished environment, resulting in a place of comfort and well-being, ideal for a hospital – in effect it should not feel like a hospital. To us, that is its greatest accolade. 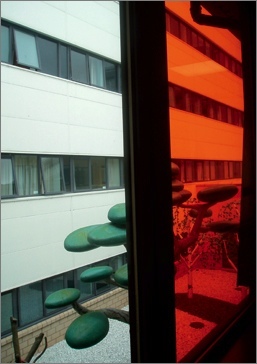 The first phase of the Art Project built on research by the Kings Fund and the NHS Estates into how people using hospitals could see their environmental design needs in clinical spaces. Right at the beginning of the Art Project there was also consultation with the public. The team spoke to children in and out of school; they had some talk with patients – less so with the staff, at the time. The finding were written up in an Arts Strategy for the Hospital. The arts consultant and the artists used this strategy to inform their work when curating the Art Project and developing individual pieces of work. They had the overarching aim of creating a unique child and family-friendly environment. That has actually worked. The environment of the hospital is clean, it is cherished, it is beautiful, it is a place to feel welcome. In phase 2, the main architectural spaces are now populated, so it is about the internal departmental spaces. One of the things I found – I have spent a year just going around talking to people within the Hospital about how they perceive their spaces. This has been quite enlightening because I got the feeling there was a sort of ‘them’ and ‘us’. ‘Them’ being the likes of us within the arts world, within the Hospital Arts Project group, who had decided what we are going to do; and ‘us’ being (the users of the spaces), ‘well, we do not really understand what is goes on and we do not understand about the arts, so …’. I have been trying to find a way through that; find a way of creating projects which the staff and the patients and the families can be involved in. There are also sensitivities around hospital spaces, and the territorial ownership of departments by the staff – ‘this is my department’; ‘this is my space’. So, the idea of who has access to, and who is the space for, can be quite different. My job has been to include all these stakeholders, at all levels, in the project development. I am also responsible for maintaining the artistic quality of the resultant work – and in most cases it will be a physical piece. The commission in the second phase had been designed for the type of artist who works collaboratively with their audience and includes them in the final authorship. The artists will need to respect the public of a particular space as co-authors of pieces; not just the audience and recipients – and that is a special type of relationship that some artists can create. As with all arts projects, there are other agendas that can be included such as departmental cooperation, positive messages about the NHS, and any negative perceptions about certain conditions – specifically mental health. Where these formed part of the identity and shape public perception within the commission, I have included them, but generally we tried to steer away from that type of messaging within the arts projects. We have got an arts project which is included within the mental health unit. So that has to take account of its impact on users of the space, but in most other areas it is actually more about general well-being. My understanding of public in my post at the Children’s Hospital is fairly traditionally ring-fenced as being those who use the building but, even so, we have begun to expand on that definition so it is not just people noticeably involved in this conceptual space. The public of a children’s hospital, as perceived by the developers and creative practitioners in an arts project is, supposedly scarily artistically uninformed – children and young people. There is a tendency by adults to speak for young people, so art works reflect an adult perspective of the child in the first flush of youth, ie, nought to five: Bob the Builder, cartoons and such like. I have lost count of the number of times that people have asked me whether they can come to do a mural for the children, using Bob the Builder, etcetera. My own views on ‘public’ have changed and developed by the Working in Public seminars, but I do question how we, as creative commissioners and critics – and I include myself in that group – discuss this idea of ‘public and place’ in a public art context, without actually asking the audience, and recipients of the public art, what their definition would be.